Is that a ring in your pocket, or are you just happy to see me? Sometimes, when you meet that special someone, you know with every fiber of your being that they're the one for you. It could be the sight of the sun dancing along their visor. It could be the way their soft flesh is encased in their battle-hardened armor. Or perhaps it's simply because they put the "super" in super-soldier. Regardless, it's all those things and more that pushed you to finally put a ring on it. A very beautiful—and very large—diamond ring, as a matter of fact. Heck, if you can't give the love of your life a Halo ring, you might as well give 'em the next best thing, right? While you may think I'm trying my hand at writing a Halo-themed fairy tale, this was actually a not-so-little event that took place in front of the Rooster Teeth booth last Saturday in the midst of a bustling San Diego Comic-Con. After performing a scene from a particularly memorable episode of Red vs. Blue, Matt, who was dressed up as Tucker, whipped off his helmet, dropped to one knee, and asked Sister—known in the real world as Grace—if she would marry him. I can neither confirm nor deny the rumor that she accepted. However, I can divulge that the resulting embrace was long, strong, and about to get the friction on. While my words may be perfect for a rap track, I'm not sure they convey the occasion adequately. Therefore, I'd like to request your presence at the play button belonging to the following video. Upon your arrival, please tap it. I mean, hit it. I mean… watch a couple of Spartans as they prepare to ditch Lone Wolves for a lifetime of Double Team! 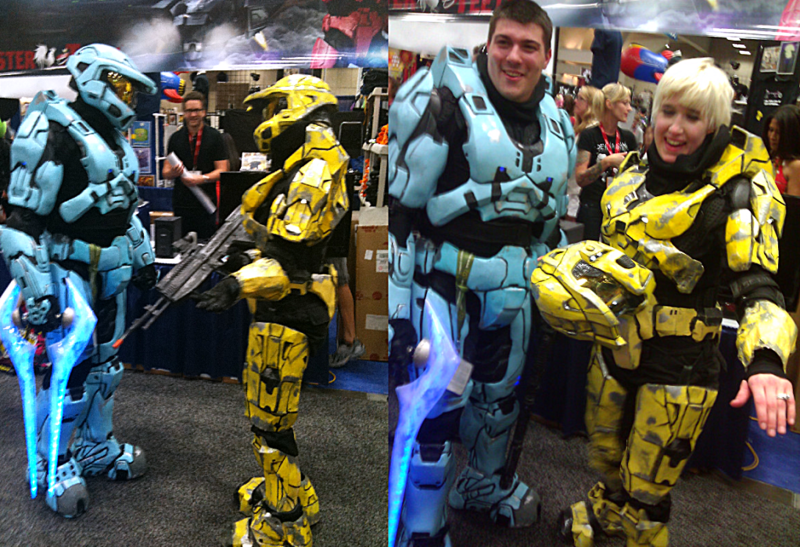 Romance wasn't the only thing in the air at this year's Comic-Con, though. Many a Halo word was released into the wild, making their way not only to avid attendees' ears but also into numerous videos recording the big moments that took place throughout the extended weekend. Who better to tell the tale than Frankie, who sat on the panels, signed the books, and shared a slew of information? My name is Frankie, and I'm a water-aholic. So, one thing you have to remember when visiting San Diego Comic-Con is that hotel rooms and flights get booked very early, which is why Kevin and I paid in advance and unrefundably guaranteed our rooms at a certain marina hotel right next to the con. So to describe us as "surprised" when the hotel said, "We gave away your rooms to a fat Jedi and a Sonic Furry, but we can try to get you a different room at the airport or on that island" is to do an injustice to the gas-face we experienced. Just across the street at the Hard Rock, however, a very lovely lady hooked us up with more capacious and convenient accommodations. Thanks to her. I believe her name was Sara but she was shining like a Madonna from a Renaissance painting, and her loveliness blinded me to whatever was on her nametag. We arrived on Thursday and our panels were all the following day, but we did attend the Microsoft Xbox showcase the night before and got to play and check out a bunch of our mothership's content, including Forza, Cliffy's latest Gears carnage and the insanely addictive Kinect Fruit Ninja. I also looked at, listened to, and literally sniffed the incredible Star Wars Limited Edition Xbox 360 with the help of Richard Velasquez—who also helped us bring the Reach console to fruition last year. The other thing I did that night was become the subject of mockery and animated gifs as I did some ad hoc interviews with press and bloggers. [Editor's note: If anybody has links to said gifs, please post them in the discussion thread. I may or may not need them for blackmail purposes.] Apparently my hotel-experience-gas-face had carried over from earlier, because I look like I am about to barf. I did not barf. And I was sober in spite of internet claims to the contrary. Because the next day was PANEL DAY. Three panels, back to back, followed by a book signing. The first panel was the easiest, because we were well-rested and ready for action. It was on fiction and video games, with me, Karen Traviss, Greg Bear, John Shirley (BioShock), David Gaider (Dragon Age) and Tony Gonzales (EVE Online). Here we got to chat with an engaged crowd about general novel-lyness and sci-fi. Karen dropped hints about the content of Glasslands —which releases in October and tells the tale of the Halo universe in the wake of the Covenant War and the defeat of the Flood. Greg is almost done with Primordium —the sequel to Cryptum , which drops in January 2012. But we were all saving ourselves for the next and biggest panel (ours, anyway) which was in the colossal room 6 and entirely dedicated to all things Halo. We were following William Shatner and Kevin Smith, who were doing a panel about Star Trek captains. At Comic-Con, this is basically a kind of Rapture, where instead of being transported to paradise, the audience is transported into the presence of William Shatner's immortal charisma. I literally had to follow in Kirk's footsteps. I even had to sit in his now vacated chair. We will not debate his profound wisdom at these proceedings. Of my seat I can only say this: Of all the stools I have encountered in my travels… his was the most… humid. Looking out at the Halo crowd as they shuffled in and displaced the Star Trek crowd (or not, since a few Trekkies stayed behind to judge or mock our new-fangled sci-fi universe), I got a bit humid myself. That's a lot of Halo fans. And yes, there will be one Terminal for each level of the game–which is a fact, in itself, connected to the story (written by our very own Kevin Grace). I am done calling this type of animation a "motion comic" because it really is a great deal more than that. It's really just stylized and in some ways, incredibly ambitious animation. There are probably more unique frames by far than in any average Saturday morning cartoon. After that we introduced Dan Ayoub, Executive Producer on Halo: Anniversary and his trusty sidekick, Dennis "Plasma" Ries, to run through the E3 demo again for the crowd. Because the E3 demo was the most stable and predictable build, we had to go back in time a little, with the non-updated Assault Rifle, rougher graphics and so on, but the crowd loved it. Whoops and cheers galore as we switched between Classic and Anniversary modes. Like the Terminal videos, a picture speaks a thousand words. So, watch the demo we put up after the panel and decide for yourself. And Dennis finally redeemed himself, tossing the very last plasma of the demo right into the face of a charging Elite. We were all choked up. It was like the end of Rocky IV . By the way, as I write this, I am splashing around in the water. I am doing donuts in the water. I am throwing grenades in the water. It turns out that I love any and all video game water. I also have a mania for expecting that there should be a rocket launcher, or other treasure, hidden behind every waterfall, and I continue to be disappointed in this realm. bs angel here. It's worth noting that as I write this Bulletin, I'm splashing around in the water as well. But my water is tangible—not to mention cold to the touch—because I'm currently on vacation, enjoying the scenic view, fresh air, and numerous bugs that insist on repeatedly biting my now bump-covered body. If you happen to have some time to sit back and relax too—hopefully without being subjected to swarms of starving insects—I highly recommend filling your earholes with the smooth voices of David Ellis and Frank O'Connor with the latest episode of the Sparkast. In this episode, the duo is joined by Karen Traviss, who talks about the process of helping to shape the post-Halo 3 universe. There's even a bonus finale with a special guest. I'd give you a hint about the identity of the special guest, but I don't want to ruin the Max Hoberman surprise. Yup, you won't be getting any spoilers from me, that's for sure! Anyway, tune in here at your earliest convenience, and subscribe via Zune or iTunes while you're at it. Wait, I'm not being demanding, am I? If so, imagine me smiling when I say that. There, all better! Now, back to business. Just because I'm sitting by the lake, enjoying the gentle waves caressing my lowermost phalanges, that doesn't mean there aren't pressing Anniversary-related questions left over from Comic-Con that still need answers. I refuse to jump into the colder-than-it-should-be-considering-it's-July water, however I'll gladly dive straight into your inquiries. You can't ever say I didn't do anything for you, for the record. The Title Update for Reach is currently slated to be available before Anniversary ships—so sometime significantly before November 15th. Both Anniversary owners and Reach owners will get it as it will be included on the Anniversary disc and also released on Xbox LIVE. PS: And it has something to do with s'mores. And the fact that it's a legitimate strategy. Anniversary contains the Halo campaign—updated, of course—as well as seven new Multiplayer maps that run in the Reach engine. You do not need Reach to play these, just the Anniversary disc. It all launches from one menu, just as you'd expect. Anniversary players who also own Reach will be able to install those Multiplayer maps right to their HDD. Semi-related: Reach players will be able to get the new maps too, and there will not be a significant gap between the launch of Anniversary and the availability of the seven maps as downloadable content. For some, yes. Others, no. Let me explain. Stuff that the Title Update enables will be presented via Matchmaking playlists. So for example, you could have a playlist with loads of changes called "ANNIVERSARY PLAYLIST" sitting alongside one called "NORMAL REACH STUFF" which plays with all the Reach rules intact. That means Reach players will be able to try some of the Title Update changes on certain maps and playlists, even if they don't have Anniversary. Naturally Anniversary players will have more access because of the Multiplayer maps they get. bs angel PS: While I don't have a Friday Caption Fun image for you this week due to the whole vacation thing, I do have some miscellaneous pictures from the San Diego Comic-Con festivities. I'd also like to take a second to thank Count3D, who graciously supplied many of the images in today's Bulletin. You can check out more of his Comic-Con-related adventures here. Gabe and Tycho of Penny Arcade, drawing Mister, er Master, Chief. Todd McFarlane shows off his manly figure. I think something's wrong with his auto-aim, 'cause he's not taking his eyes off me. An elegant weapon for a more civilized age. Or a more pink one, anyway.